A tiny country that’s beginning to come into the spotlight, Slovenia is undoubtedly one of the most beautiful and underrated places in Europe. Just 45 minutes from the capital city of Ljubljana is a magical town called Bled. Home to some of the most picturesque views in the world, Lake Bled is a gem of a place, despite its somewhat morbid-sounding name. 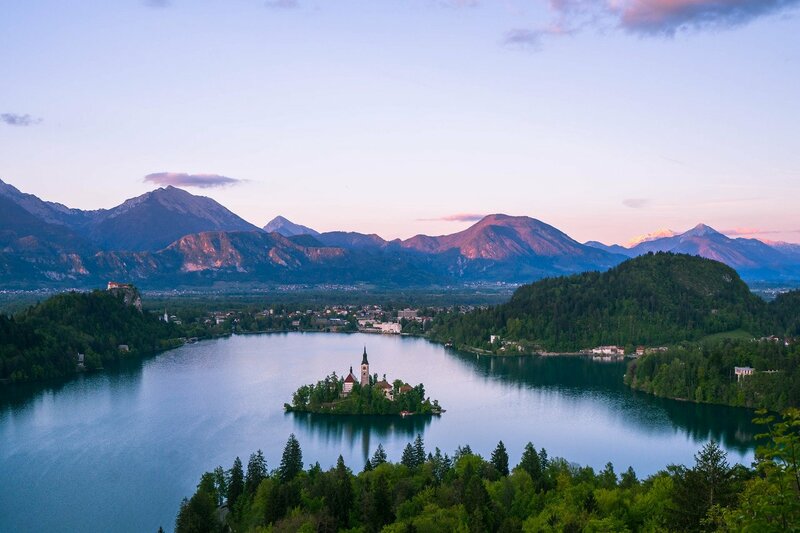 With its many kilometers of hiking trails, delicious food options, and proximity to some serious natural spectacles, there are an endless amount of things to do in Lake Bled and in Slovenia. To help you create your itinerary (or inspire you to plan a trip! ), here are 12 of the most interesting activities you can experience during a visit to this fairytale place. Why Travel to Lake Bled, Slovenia? 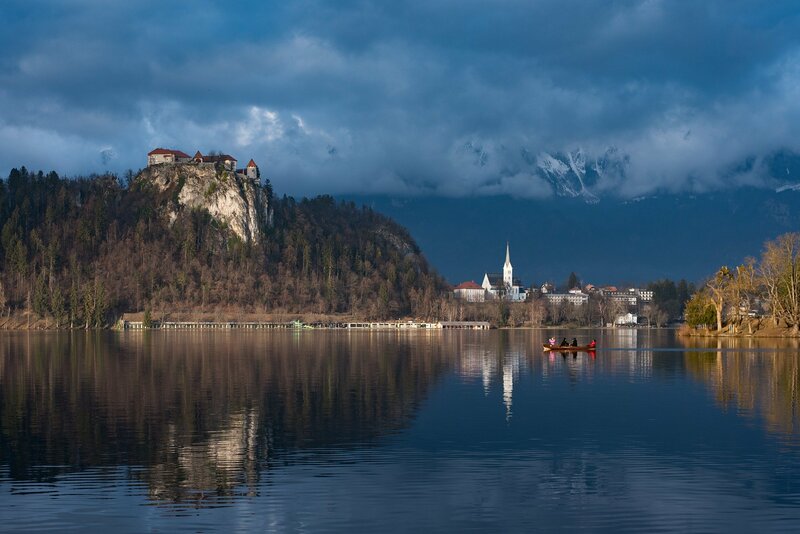 You might recognize Lake Bled from pictures of its iconic island, which hosts a small, charming church steeple set against the backdrop of the Julian Alps. It’s an easy weekend getaway that’s easily accessible from most major European cities. During your visit, you’ll find that there are so many fun and exciting things to do in Lake Bled – castles, boat rides, hikes and more await you. It’s worth sticking around for a day or two (or four, if you’re feeling adventurous) to soak it all in. If you’ve seen any photos of Lake Bled, you’ll probably recognize the tiny church on Bled Island. This is the Church of the Assumption, and it was built in 1465, with 99 steps leading to its entrance. Tradition mandates that in weddings occurring in the chapel, grooms must carry their brides up all 99 steps. (Talk about a pre-wedding workout!) Although visiting the island is one of the most popular activities in Lake Bled, it’s definitely not something you should miss. On the island, there’s also a famous wishing bell. Legend has it that there was a woman living in Bled Castle whose husband drowned in the lake. In her sadness, she took many of her gold and silver items and sent them to someone to create a bell for the small church on the island. However, the boat carrying the bell also capsized, sending the bell to the bottom of the lake. Upon hearing this, she sold all her belongings, donated all of the money to build a new church, and fled to Rome and became a nun. Some time later, the Pope heard her story and created a new bell for the church in her honor. Today, as the story goes, if you ring the Bled church bell three times and make a wish, it will come true. To arrive at the island, you’ll need to rent a boat (see below) or take a traditional Pletna boat (€14 round trip). 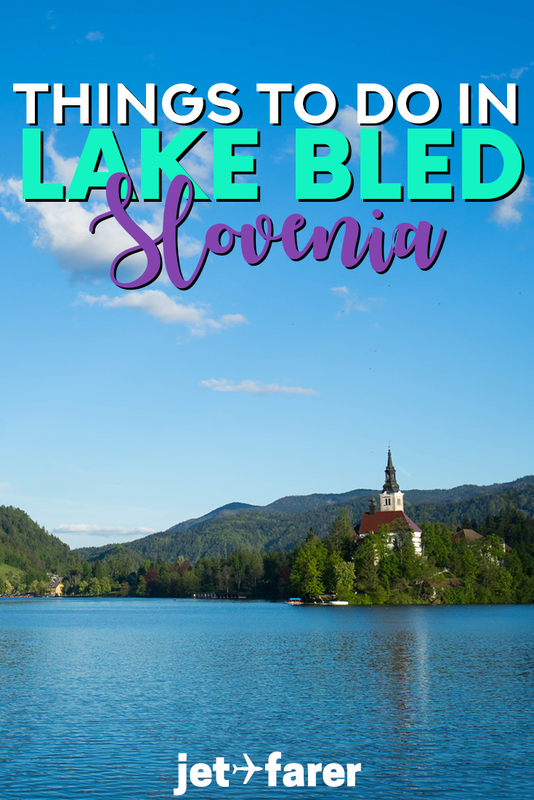 This one definitely overlaps with #1 because you have to ride a boat to get to Bled Island. However, you can also rent paddle boats and kayaks to explore the rest of the lake on your own. If the weather is clear and sunny, I highly recommend doing this in the early morning before the swarms of day trippers arrive at the lake. Renting a boat is a wonderful way to explore the lake and see some of the beautiful surroundings, like the island and Bled Castle. There’s a reason why this is one of the best things to do in Lake Bled. Rentals typically cost ~€10 per hour for a kayak and ~€20 per hour for a rowboat, depending on the season. Situated atop a striking cliff, Bled Castle is another one of Lake Bled’s most stunning attractions. Visitors can hike up to the castle, where they can explore the grounds or go inside for €11 per person. On Bled castle’s grounds, there’s a museum, several rooms and areas to explore, and a cafe. Alternatively, take a look up at this magnificent building in the night time: it’s usually lit up in a really beautiful and eye-catching way. If you love historic buildings and looking for other things to see around Lake Bled, you’re in luck – Slovenia is full of them! Check out these other gorgeous castles in Slovenia. Of all of the things to do in Lake Bled, this one is the best for outdoor enthusiasts. Vintgar Gorge is truly a treat for the senses. Featuring cool, turquoise water, colorful wildflowers, and striking cliff-like rock walls, the paths here are a lovely way to spend an afternoon hiking and admiring the beautiful nature of Triglav National Park. Vintgar Gorge is a short drive (or a long walk) from the Lake Bled city center, and costs €5 to enter. 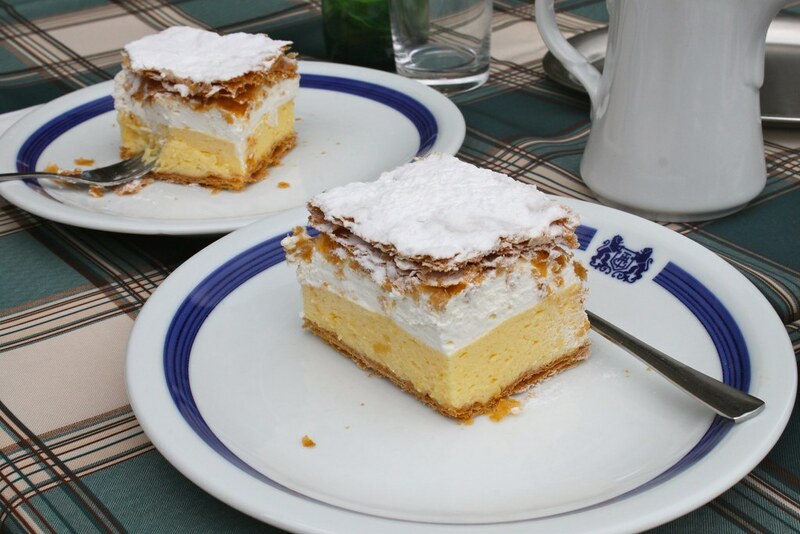 One of the most famous dishes in the area is kremšnita, Lake Bled’s cream cake. Made of vanilla cream and moist butter cake, it’s a treat that’s absolutely to die for. The original Bled cream cake was developed at Park Cafe, a riverside cafe in the town center, but can now be found in many cafes and restaurants around the area. If you’re looking for things to eat in Lake Bled, you can’t leave Bled without trying this delightful Slovenian dessert. For a low-key way to spend an hour or two, take a stroll around the lake. Yes, all the way around! In Bled, there’s a paved pathway that extends the entire perimeter of the lake. Here, you can catch a glimpse of Bled Island and Bled Castle from all kinds of different angles. It’s the perfect place to wander around early in the mornings or around sunset, when the trails are buzzing with life. On the trail, which follows the lakeside, you’ll pass by the Bled Tennis Club, the Bled Campsite, and the entrance to Ojstrica/Osjonica trail (see #8). Covered by trees, it’s also a great way for people-watching, as locals and tourists alike can be found chatting, exercising, or hanging out on the trail. In the summertime, there’s no better way to enjoy the lake than by taking a dip in it. Put on your swimsuit and jump right in, or simply sunbathe on a nearby shore. While there is a trail that runs the entire perimeter of the lake (with several outlets to walk right up to the late), the only designated swimming area is Grajsko kopališče, the castle bathing area. Beware, this is one of the top things to do in Lake Bled in the Summer – this area gets super crowded! One would be remiss if they didn’t a bird’s eye view of this stunning place. Lake Bled’s most postcard perfect lookout point is called Ojstrica, and it is certainly spectacular. About a 30-45 minute hike from the perimeter trail, a slim dirt trail leads you up a few switchbacks to a panoramic viewpoint of Lake Bled, perfect for an early-morning or sunset activity. For more information on the Ojstrica hike, like how to get there and how long it takes, check out our guide here. If you’re looking for an extra challenge, continue your hike up to Osjonica, another viewpoint that’s a bit higher up the mountain. Personally, I think the view of Lake Bled from Ojstrica is better, but it’s a fun activity to try out both viewpoints and decide for yourself. There’s something so nice and charming about Bled’s windy, one-lane streets, and riding a bike is a great way to see them. Biking is also a great way to get to the surrounding areas, like Vintgar Gorge and the nearby Radovna Valley. There are plenty of bike rental shops in the Bled township, and it’s definitely worth taking a spin around the nearby countryside, too. Once you procure a bike, the beautiful Triglav National Park area and all of Bled is your oyster – explore it to your heart’s content. 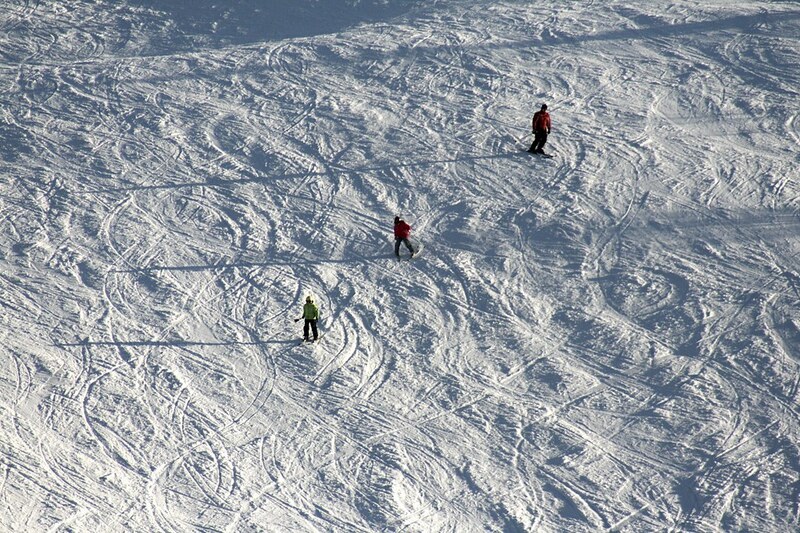 If you’re a fan of outdoor sports, one interesting thing about Bled is that you can hit the slopes year round. During wintertime, the nearby slopes at Straža are available and open to skiiers of all levels. Perhaps one of the weirdest things to do in Lake Bled, in the summer, there’s a toboggan track where visitors can slide down those same slopes! Either way, if you’re hoping to rush down a hill at lightning speed, Bled’s got you covered, no matter what time of year it is. At some point, when you finish all of the hiking, paddling, and biking, you might be hungry. This is the perfect time to enjoy a traditional Slovenian meal. While I was in Slovenia, one of my favorite things about it was the wide variety of (cheap and delicious!) food. The Slovenian dishes here are flavorful and succulent… and are, of course, a fantastic way to round out an active day. There are many restaurants in Bled’s town center that serve Slovenian food. While I was there, I ate at Spica and really enjoyed it, but there are many others like Park Cafe and Oštarija Peglez’n. When you’ve chosen a restaurant, be sure to try some of my favorites – zlikrofi, the traditional meat dumplings, or struklji, a Slovenian savory puff pastry. Or, look here for more delicious Slovenian dishes to try. And, of course, wash it all down with some Slovenian wine – some of the best in the region – and a kremšnita, or Bled’s famous cream cake. Although Bled often steals the spotlight, Triglav National Park, the surrounding area, is nothing to sneeze at. Situated amidst the striking Julian Alps, the park is full of some incredible landscapes. And although it’s not technically in the town, exploring the park definitely belongs on any list of things to do in Lake Bled. If you have a car, drive up towards Kranjska Gora for some epic mountain views. Alternatively, head to Bohinj and Savica Waterfall to see some of the most beautiful lake areas in the country. Do yourself a favor. Don’t skip Triglav National Park. It’s worth the time and effort to explore this incredibly beautiful Bled region fully. Have we convinced you to visit Lake Bled yet? If so, here are some links to help you get started with planning your trip. **Some of the links below are affiliate links. We many receive a commission when you make a purchase from any these links (of course, at no additional cost to you!). We keep it real at Jetfarer and only recommend companies we use and trust. Looking for a place to stay? Here’s a long list of hotels and hostels in Lake Bled. Want our recommendation? We highly recommend the Old Parish House, a cozy lakeside bed and breakfast (right next to Bled Castle!) that’s inside a renovated parish hall. Traveling internationally? Don’t get caught without travel insurance – we recommend our favorite affordable and comprehensive provider, World Nomads. Need more information on Slovenia? Check out our Slovenia destination page for the good stuff. Holy Moly that is insanely gorgeous!! I want to go there immediately! Wonderful photos and great post! Your pictures are amazing and this lake has so many amazing spots to enjoy. Thanks for sharing! Ooh the info about the view points is great, thanks for sharing that! I’ll be there in August so cant wait to do these highlights and hidden gems! Bled was so magical, as was the whole surrounding area! I was there in the summer and rode the toboggan and it was actually so fun.